If you're in the market for affordable outdoor furniture that is available at a major retailer, consider Home Trends patio furniture. Home Trends is an exclusive brand of Wal-Mart. It is a trendy line of "upscale" home furnishings at discount prices. Home Trend's patio furniture options vary by season, and two different styles are available: Urban Haven, which is slightly traditional, and Uptown Views, which has a more modern look. Some pieces can be purchased in-store, while others must be ordered at Walmart.com, but may be available for free shipping to your local store. Starting in early spring, stores will carry more patio furniture stock in anticipation of summer. Create an outdoor living room with a six-piece set that includes a coffee table, two lounge chairs, ottomans and a love seat. Another option is a cushioned sectional sofa, also available with a coffee table. If you prefer to lounge by the fire, purchase Home Trends' fire pit that comes with a rust-proof table and four swivel chairs. Most sets cost less than $700, which is considerably less expensive than many conversation sets on the market. An aluminum, rectangular slatted table comes with six chairs and throw pillows for a cozy dinner al fresco. A smaller square table is available with four chairs. For smaller spaces or poolside snacks, opt for a petite bistro table that comes with two chairs. Create a quiet space for contemplation in your garden by installing an aluminum armless bench. Home Trends offers rugs that can be used indoors or out. They are stain, fade and mildew resistant. 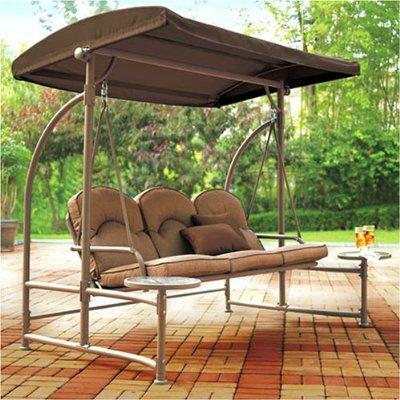 Purchase a crank-lift umbrella that coordinates with many of Home Trends' tables. Nesting patio tables provide a convenient surface on which to set your drink and are versatile as they can be easily moved and rearranged.